Climate change is possibly the most highly profiled scientific issue of our time. The projected changes in temperature and rainfall are substantial, as will be the associated impacts on biodiversity, sea level, the health and agricultural sectors, and the economy. Consequently, it is not surprising that the eyes of the world are focused on the science of climate change and its predicted impacts, and the implications thereof for the nations of the world. For developing countries, generally recognised as being most vulnerable to the effects of climate change, there is much at stake as they seek to chart their low carbon development trajectory into the future and in so doing secure a share of available global funding to assist in this process. The Intergovernmental Panel on Climate Change (IPCC) was established in 1988 by the World Meteorological Organization and the United Nations Environment Programme to inform policy decisions on mitigation and adaptation options relating to climate change. Through periodic assessment reports on climate change science and its global and regional impacts, the IPCC has established a commendable and significant reputation  one that led to it being awarded a share of the 2007 Nobel Peace Prize. But against a backdrop of increasing politicisation of climate change impacts and in recognition of the high stakes involved, the IPCC assessment reports have come under intense scrutiny and controversies have erupted over their accuracy. They have even been accused of a perceived bias with regard to climate policy. The widely publicised controversies surrounding the IPCC Fourth Assessment report, particularly the Himalayan glacier error and the 'Climategate' events that occurred at the University of East Anglia, have raised questions about the credibility of the IPCC process. 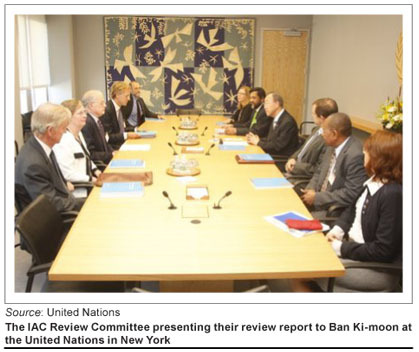 In the wake of these controversies, the InterAcademy Council (IAC), an Amsterdam-based body coordinating the world's science academies, was asked by the United Nations (UN) Secretary-General Ban Ki-moon and the IPCC chair, Rajendra Pachauri, to conduct an independent review of the IPCC's processes and procedures and to recommend ways to strengthen these. The report is available online at http://reviewipcc.interacademycouncil.net/. Having served as vice-chair of the 12-member committee which has recently submitted its report, I am able to reflect on some of the outcomes and more particularly on what this process might mean for South African science and scientists in the near future. Our review was conducted from April to August 2010 and was informed by public presentations from the IPCC and UN officials, as well as by scientists with wide-ranging views of the IPCC processes and procedures. In addition, a widely disseminated questionnaire yielded over 400 thoughtful responses from individuals across the globe. Our report concluded that the IPCC process had been a success overall  it can be credited with raising public awareness about climate change and its associated impacts. It has also sustained the enthusiastic commitment of thousands of volunteer scientists  not to mention buy-in of 194 participating governments  over a period of more than 20 years. Through its unique partnership between scientists and governments, the IPCC has also raised the level of scientific debate and influenced the science agendas of many nations. Notwithstanding these positive comments, the IAC review committee was critical of many of the IPCC's processes and made a number of recommendations to strengthen them. Fundamental reforms were recommended to the IPCC's management structure to enable it to benefit from the governance revolution that has affected most organisations of its type over the past 20 years, and to equip it to handle the intense public and media interest in climate change that now exists. The governance reforms relate to an increasing trend towards greater accountability and transparency. Hence, our recommendations included the establishment of an executive committee to act on the panel's behalf to ensure that an ongoing decision-making capability is maintained, the establishment of an executive director post to provide authority and leadership to the secretariat in Geneva and to handle day-to-day operations in an effective manner, the development and adoption of a conflict of interest policy and the strengthening of the IPCC's communication function. The report also recommended a single term of office for the chair of the IPCC and working group co-chairs. This recommendation was founded on the recognition of the volunteer nature of these positions, the relatively long period of a single term (about 6 years) and to maintain a variety of perspectives and a fresh approach to each assessment. Apart from these governance and management reforms, there were strong recommendations aimed at strengthening the IPCC processes. The committee found that although, to a large extent, adequate policies and guidelines were in place, they were not always followed or were applied inconsistently across the IPCC's three working groups. For example, in the case of the notorious Himalayan glacier error, in which it was stated in the Working Group II report that the likelihood of the Himalayan glaciers disappearing by the year 2035 and perhaps sooner is very high, the error was attributed partly to a failure of the review process. IPCC procedures require that all chapters undergo two formal reviews: the first by experts formally appointed as reviewers and a second round in which both experts and governments participate. In some cases, there is even an informal review of preliminary text before the formal review process. Over and above this there are at least two review editors appointed per chapter, whose responsibility it is to ensure that the reviewers' comments and criticisms are addressed by the chapter authors. In the Himalayan glacier example, reviewers had in fact questioned the statement that glaciers would disappear by 2035, yet the review comments were ignored and consequently the error slipped through. The committee concluded that stronger enforcement of existing IPCC review procedures could minimise the chance of errors, and hence recommended strengthening the role and authority of review editors so that they are able to properly discharge their duties. Review editors should also ensure that genuine controversies are reflected in the report and should be satisfied that due consideration has been given to properly documented alternative views. Lead authors should document explicitly that the full range of thoughtful scientific views has been considered. The use of so-called grey literature from unpublished or non-peer-reviewed sources has been particularly controversial. On balance, it was found that such sources of information are relevant and appropriate and that their use should be continued, but with the caveat that the IPCC's guidelines for evaluating such sources be revised and strictly enforced to ensure that unpublished and non-peer-reviewed literature is appropriately flagged in the report. The committee also called for more consistency regarding how each working group characterises uncertainty. In the Fourth Assessment, each working group used a different variation of the IPCC's uncertainty guidelines and the committee found that the guidance was not always followed. The Working Group II report, for example, contains many statements that were assigned high confidence, but for which there exists little evidence. It was recommended that in future assessments, all working groups should qualify their understanding of a topic by describing the amount of evidence available and the degree of agreement among experts. Another issue that emerged strongly during the interviews conducted with key scientists who had participated in the IPCC process (including those from South Africa), was that of transparency. Several of the stages of the assessment process are poorly understood, even by those who have participated in them. The selection of authors, working group co-chairs and reviewers remains a mystery to many. The committee therefore felt it essential that the processes and procedures used to produce assessment reports be as transparent as possible and made a number of recommendations in this regard. Some of the issues raised by the committee for future consideration concerned the level of participation of developing countries in the IPCC process. This low level of participation has been a concern for most of the IPCC's history and significant progress has been achieved in increasing the level of participation of governments of developing countries over the past two decades  their membership now comprises 69%. Some progress has also been made in increasing the number of scientists from developing countries, although more than 75% of the authors still come from developed countries. For example, in the Fifth Assessment, South Africa will have more than ten participating scientists. Some of the difficulties facing developing country scientists that emerged during the review process were a lack of support from their home institutions, their marginalisation during the process, poor access to literature and the relatively small skills base in their home countries; these findings imply that a disproportionate burden is carried by a few qualified scientists. Having been exposed first hand to discussions about these constraints, it is evident that much can be done within South Africa to overcome these barriers. For example, the government could spearhead a campaign in which scientists who contribute could be given greater recognition by their home institutions and the media. Recognition by their home institutions should extend to an appropriate level of support to enable them to fulfil their tasks in a manner that is more aligned to the support given to their developed country counterparts. The government could also seek opportunities and funding to enable South African scientists to be seconded to technical support units located in developed countries to facilitate interaction, cooperation and further human capital development. They could also promote the establishment of regional facilities where authors from the region could spend time interacting and writing. The report was considered at the IPCC Plenary session in Busan, South Korea on 14 October 2010. The Panel agreed to implement immediately many of the recommendations, including those on uncertainty and non-peer-reviewed literature. In addition, a task group was established to address the establishment of an executive committee and review the key responsibilities of the Secretariat, as well as the chairs and co-chairs of the working groups. In a press statement released at the conclusion of the meeting, it was stated that the Fifth Assessment Report, which will be published in 2014, remains on course and will benefit from the Panel's decisions.